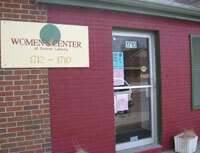 Women's Center of Greater Lansing, Inc.
We are located on the south side of Michigan Avenue, between Leslie and Shepard Streets about half way between Sparrow Hospital and Frandor. The Women's Center is easily accessible by the number one bus. You can also find directions to the Women's Center at Google Maps. Evening and Saturday appointments are available by apt.